A Huntingburg man wanted on active warrants was placed under arrest after he allegedly attacked and injured a Huntingburg police officer during a traffic stop late Monday morning on the city’s northside. Just before 11:30 Monday morning an officer with the Huntingburg Police Department conducted the stop near the intersection of 19th Street and Medical Arts Drive. Police say during the stop, the officer recognized 22-year old Austin Zehr who was in the passenger seat of the vehicle and had active warrants out of Dubois County. The officer ordered Zehr out of the vehicle and attempted to detain him. Police say Zehr exited the vehicle and attacked the officer striking him multiple times with brass knuckles. They say Zehr continued to resist however, the officer was able to take Zehr to the ground and gain control of him until additional officers arrived. The say the officer sustained multiple minor injuries in the attack. He was taken by ambulance to the emergency room of Memorial Hospital in Jasper where he was evaluated and released. During the incident Dubois County Dispatch received several 911 calls reporting an officer being attacked which allowed additional officers to be dispatched for assistance. The Huntingburg Police would like to thank the citizens who made the calls. Zehr was taken to and booked into the Dubois County Security Center on a Class A Misdemeanor count of theft and a Level 6 felony county of failure to return to lawful detention. He is facing additional charges of Level 3 felony aggravated battery, two Level 5 felony counts of battery on public safety official, two Level 6 felony counts of resisting law enforcement, a Level 5 felony count of intimidation with a deadly weapon, a Level 6 felony count of possession of methamphetamines, and a Level 6 felony count of possession of syringe. The Dubois Co. Sheriff’s Department and Memorial Hospital Emergency Medical Services assisted at the scene. 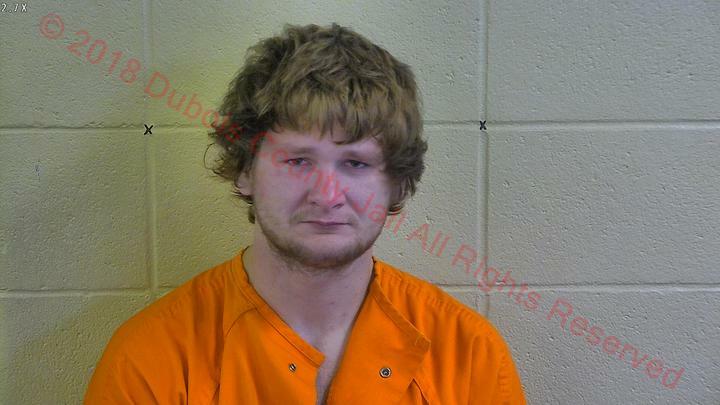 Be the first to comment on "Man Arrested After Attack on Huntingburg Officer"